December 6, 2016 — Links International Journal of Socialist Renewal — December 3 saw another mega-protest hit President Park Geun-hye’s regime, with more than 2.32 million angry South Koreans participating in the 6th national candlelight protest called in recent weeks. Concerns of a lower turn out were swept aside, with the turnout surpassing the recently set record of 2 million people for the largest mobilisation in the country's history. Protesters demanded Park’s immediate and unconditional resignation. The massive outpour of anger has put back in motion an impeachment process that Park had hoped to derail. This enormous mobilisation was a direct response to Park’s November 29 speech, in which she first mentioned her intention to resign, but only in accordance with a plan set out by parliament. Her manoeuvre worked, with her ruling Saenuri party welcoming the proposal and the non-Park faction of Saenuri MPs uniting with the pro-Park majority on the condition she set the date for her in late April, 2017. The opposition rejected Park’s proposal, criticizing Park’s manoeuvre as an attempt to evade parliamentary impeachment. However, the opposition needs the support of at least some of the ruling party MPs, as impeachment requires a two-thirds majority votes. With non-Park MPs turning their backs on the impeachment plan, opposition parties had to take a step back, and gave up on plans to vote on impeachment on December 2. The conservative media, which provoked popular anger by exposing a series of scandals involving Park, has also retreated, calling for a solution within the framework of law and order and pressuring the opposition for a political solution. Though evading a direct confrontation with the candlelight protesters, the conservative media wants to stop mobilisations and follow a path that falls within the legal framework, unless impeachment becomes impossible. However, the people in the streets have refused to listen to any message of compromise and exhortation. More and more people are upset with the indecision of the opposition parties, as well as the ruling party and the president. In addition to Park and her accomplices, the ruling Saenuri party itself has become a target of ever-growing popular anger. On the afternoon of December 3, tens of thousands gathered in front of the Saenuri party’s headquarters, demanding “Disband Saenuri Party!” Nationwide, scores of ruling party offices were targeted by angry protesters. People shouted their wrath at MPs and the Saenuri party as a whole. At 7pm, a huge wave of candles converged on the main rally site, Gwanghwamoon Square, from all directions. By then tens of thousands had already begun to march toward the police blockades, just 100 metres away from the Blue House, the presidential palace. Following the main rally, people marched again toward the blockades, holding open mic rallies deep into the night. 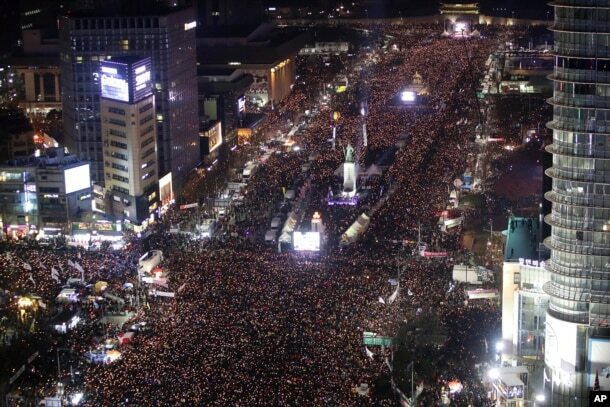 The rally in Seoul mobilised more than 1.7 million people, a new record-high, and 2.32 million protested nationwide. Outside of Seoul, 620,000 people joined in candlelight rallies in hundreds of cities and towns. Major cities and provincial capital also witnessed their biggest protest in history: Busan (200,000), Gwangju (200,000), Daegu (50,000), and Daejeon (50,000). The people in the streets have begun shouting more radical slogans: “Step down immediately”; “No honourable resignation”; “Arrest Park Geun-hye immediately”; and “Disband the accomplice Saenuri Party!” The protest are getting more radicalised both in terms of demands and the attitudes of the protesters. The enormous scale of mobilisation is stunning, especially because the rallies were organised as nationwide simultaneous protests. Even organisers of the rally expected a smaller turnout than the previous week’s 1.9 million mobilisation. However, after the president’s November 29 speech, the protest easily broke the record, with hundreds of thousands of first-time protesters joining in. Following the mega-protest, the situation remains unclear. The opposition is supposed to vote for impeachment on December 9, with or without the dissident MPs. If impeachment fails, there will be even bigger protests. That is what the pundits and conservative media fear most. In the face of a further escalation of the candlelight protests, a solution within the framework of law and order seems at risk. However, on the evening of December 4, dissident ruling party MPs decided to give up on dialogue with the president and join the opposition in the impeachment procedure scheduled for December 9. The huge pressure has put the presidential impeachment process back on track. In spite of efforts to prevent a regime crisis, the situation has unleashed its own dynamics. Park is totally isolated and faced with the fate of an eventual ouster. At the moment, although no major new scandal has emerged, a series of parliament hearings, an investigation by the special prosecution, and the trials of Choi Soon-Sil and her accomplices are scheduled to take place soon, all of which will keep the issue in the media. What next? Nobody knows. The political situation is fluctuating from moment to moment, but despite the wishes of conservative media and institutional politics the paths of orderly retreat or honourable retreat are blocked for good. At this conjuncture, what is most certain is this: as long as Park refuses to resign, millions of candles will not be extinguished, and their numbers will continue to grow. It is therefore time to imagine something bigger than mere impeachment. Youngsu Won is coordinator of the International Forum in Korea and an international contributor to Links.